Providing you the best range of lllt comb with head massager and low level laser comb with effective & timely delivery. DR CURE AND CARE leading manufacturer of Laser Diode comb. Have laser diode of 650 nm with power of 30 mw of laser frequency. Red light therapy of LED also treat scalp health. Two mode operation like: (1) Vibration may result increases the blood circulation of scalp and (2) Diode laser therapy control hair fall and promote hair growth. LLLT is certainly no miracle cure for hair loss. But the diode laser comb has been OK'd by the Food and Drug Administration for both safety AND effectiveness. It is cleared for hair growth and the treatment of hair loss. ... LLLT is a non-chemical, non-invasive option to help people grow fuller, thicker, healthier hair. Even though its give smooth head massage and protect scalp from dandruff. We are offering a handsome and compitable Laser Basket's Comb. Which work on duel mode one is vibration( which provide blood circulation on your scalp) and second is laser ( which help to control hair fall and dandruff). A handy product with light weight. Men and women both can use for hair care. It's laser diode and red light may help to control hair fall and dandruff. Laser Therapy For Hair Fall Control. 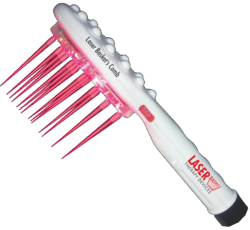 Looking for Laser Comb ?